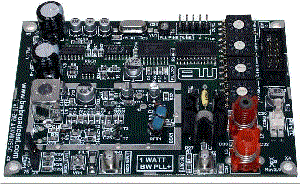 Add a Behringer DSP-1424P two band processor for under $100 and listen as your EDM LED transmitter takes on the best sounding FM station you have on the dial. Unfortunately the LED transmitter is no longer available from EDM due to the discontinuance of several key parts used in the LED.  EDM has replaced it with CS version; which uses the same case and display as the LCD version. The EDM LCD FM transmitter is a bit larger and heavier than the older LED version, unlike other transmitters using LCD's the EDM is strictly for frequency display. Other transmitter tend to use two or three buttons and display to adjust everything from audio & power levels to mono/stereo etc; the EDM LCD uses trimmer pots to set power level, L/R audio & MPX levels. I prefer this method; as it's easier to finely trim levels with trimmer pots. 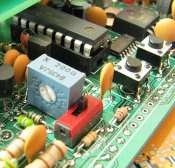 RF power is adjusted two ways: A switch determines max output; either 10 or 100 milliwatts and a trimmer is used for fine adjustment with a range from 1-100 milliwatts. Audio & RF connection are RCA and the 12 volt DC input is a 2.1mm connector (center positive) so you can unplug the old EDM LED and plug in the LCD. NOTE: Holes in the case allow easy access to audio trimmer pots and channel up/down buttons. 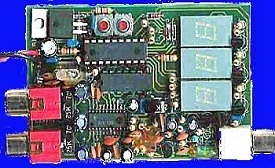 The EDM LCD transmitter is an easy to assemble kit; which includes plugging in the IC chips into their sockets, solder DC connector to PC board and mount the LCD display to the main PCB. It takes about twenty minutes to complete assembly. 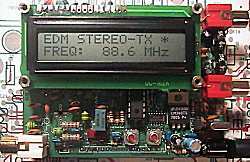 The end result is a rock solid FM transmitter that out performs all other transmitters in its class; yes even the older EDM LED version. Improvements include better low pass audio filtering which is designed to improve Stereo operation and offer even deeper bass and separation. The RF is also cleaner with improved filtering and a lower noise floor. The price for the EDM LCD is about $210 including shipping and insurance. 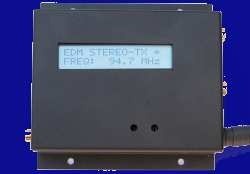 The EDM LCD FM transmitter is delivered with a compact switching power supply, a wire test antenna. 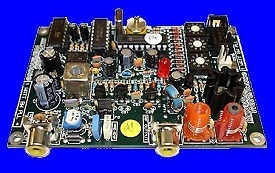 A RCA to BNC adapter is available at low cost. The EDM LCD FM transmitter remains a great value when compared to the Ramsey FM30b or FM100b which are kits where you have to assemble everything. On a score of 1-10; the EDM LCD FM transmitter is an easy 12. We remain sold on EDM for a number of reasons, First quality: the EDM transmitters are solid performers in every way, I have even drowned one while it was on the air! Dried it out, fired it back up and it went right back on the air. Second delivery: From the time the transmitter is ordered to the time it lands on the doorstep is within a week no matter where you live on the planet. Third: customer service is second to none, e-mails are responded to right away, even after I killed my first one, I had it back on the air in a week where it remains three plus years later. I have a second EDM LED as a back up; it has been on the air twice for less than an hour while I dried out the other one. the new EDM LCD FM is here.